Initially Bhola Garden was run by WOD Trust, a charity registered in Bangladesh (WOD = Welfare for Orphan and Disabled), which was funded by a group of donors. In 2007 those donors paid for WOD Trust to purchase the land and buildings at Bhola Garden. Then from April 2007 Bhola’s Children took over as WOD Trust’s principal source of funds. The donors and associated supporters have continued to provide funds and in particular have financed the purchase of additional land. In 2015 we decided to apply for National NGO status. We formed a new trust called BCSB (Bhola’s Children Special-School Bangladesh) and elected to remove ‘orphans’ from our description. All the trustees of this new trust are well respected Bangladeshis who either live in Bhola or have strong connections with the island. The chairman lives in Bhola Town and is a local politician, the deputy chairman is a retired University Professor and the treasurer is a retired Lt Colonel in the Bangladeshi army, now a director of a major life assurance company. The other trustees are college or school principals, and local businessmen. 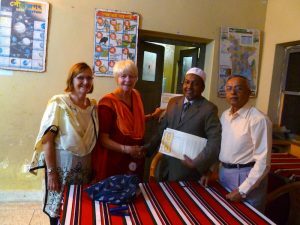 A Memorandum of Understanding between Bhola’s Children Special-School Bangladesh and Bhola’s Children UK charity governs the relationship between the two bodies. The relationship between the two bodies is excellent and no unilateral decisions can be made.